Three hundred years of the Borders War has seen the world reduced to five nations. In the year 2548, a treaty was signed ending the war, and ensuring a peace between countries, at least on the surface. Now in the year 2558, all nationalities have gathered for the first Olympic games since the war started. Attention from the world media and citizens are focused on two men and one competition, the Rifle competition which pits soldiers from each army against the other, this time in tournament rather than battle. And one duel has been raised above them all, that between the Dark Ops officer from the People’s Republic of Singapore, Armise Darcan and the Continental States Peacemaker Merq Grayson. Both men were trained from the very youngest of age to be the most highly skilled and dedicated soldier possible, and the most accurate sniper each side produced. On mission after mission throughout the Borders War Merq and Armise battled each other as they pursued the goals of their own countries, neither coming out ahead of the other. And now they face each other once more, only this time on the field of competition. But while their relationship has always been one of violence and physical brutality, they have also hidden another aspect to their relationship, one neither truly understands but is compelled to continue. Against the backdrop of peace and the Olympic Games, another conflict is playing out, one that will have consequences not just for Merq and Armise but for the world they live in. Only their skills and maybe something more will keep both men alive to survive another day. One Breath One Bullet is only 80 pages long but within its small frame it packs a much larger punch and more powerful story than I could have imagined. S.A. McAuley has created a world where war has raged for over three hundred years, with devastating results, wiping out half the world populations, reducing the planet’s air to a toxic cloud and numerous environs to desert unfit for human habitation. McAuley’s descriptions paint a grim and despairing picture of the cost of prolonged warfare on both the planet and it citizens. It’s a gritty, noxious universe and the author makes it horribly real in every aspect. This is an intense story and at its heart are the two soldiers from opposing countries and ideologies. Despite being on opposing sides, Merq Grayson and Armise Darcan have much in common. They are close in age and physique, even closer in their mentalities and emotional makeup. These are brutal, dangerous predators masquerading as highly skilled soldiers at the top of their professions and yet, they are also something far more. Merq and Armise are also highly complicated personalities with more layers than can be described. They will dishearten you with their characters and then turn around and astonish you with surprises. McAuley has created, in Merq and Armise, two characters so real and memorable, that you will be insatiable in your need for more than just these 80 pages and luckily we will get them. The story is told from Merq’s pov and jumps time periods from mission to mission. Through Merq’s perspective, we see the world as it has become and watch the past as the two men compete to complete a search for an object both countries desperately want to acquire. The real measure of each man slowly seeps out like a small blood trail the reader must follow to get to the truth behind the facades erected by man and nation. Those expecting a romantic love story will be disappointed as the relationship between these men is not for the faint hearted but authentic to the characters we are slowly coming to know. I don’t think I can adequately describe how compelling these brutal, war hardened men become or how thrilling and suspenseful the plot turns involved. There are some beautiful twists and turns involved that just make this story and its characters all the more amazing considering the length of the book. McAuley has created a three page Index at the end of the book detailing time lines, characters, glossary etc. I am not a fan of this element as readers of my reviews already know. Happily, I can report it is not necessary to refer to the Index to understand the basics of the world the author has created or some of the war weaponry used in the conflict. McAuley folds that necessary information into the story just as it should be, making those pages interesting but optional. 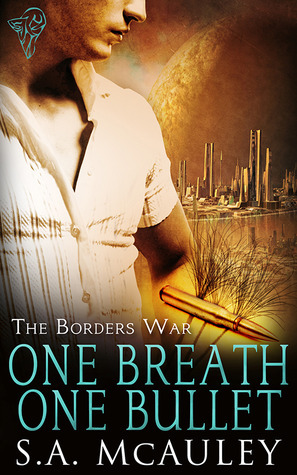 One Breath, One Bullet is the opening salvo to a new series, The Borders War and I, for one, can’t wait for more. The men, their world, and the events to come are deserving of a grand scale series to equal their measure. I am confident in S.A. McAuley’s ability to deliver it. Consider this a must have, must read and look for it on the Best of lists at the end of the year. I hated the heat of the desert. The mask on my face was confining, filling with the condensation of each breath I dragged into my lungs and forced back out in shallow gasps. The goggles over my eyes should have protected me from the yellow and grey cloud of Chemsense the Dark Continental Republic Army had unleashed on our battalion, but I could feel my eyes watering, the liquid gathering in pools that threatened to make my skin too damp to maintain the protective seal. I was on my knees and I couldn’t remember when I’d stopped walking. I wasn’t far enough away yet. The shouts of the DCR soldiers—and the sonicpops of their weapons as they picked off States soldiers—were muffled but still too close. My body tilted, and I planted my hands into the sand without thought. I collapsed into the dune when my right shoulder ground together, bone against bone, tendons ripping. I thought those DCR goons had only managed to dislocate it, but this pain was worse than that—a grinding impact of racking, vision-blackening pain that didn’t ebb even when I flopped onto my back and let my arm lie unmoving in the scorching sand. 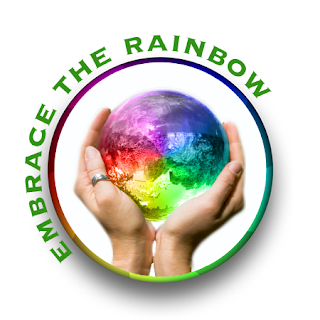 My mantra, pounded into me through years of training, repeated in my head as I consciously stilled my body. Death the only real victory. Cover art by Posh Gosh is disappointing. Who is that cover model supposed to be? And that modern shirt? So many missed opportunities to do justice for such an incredible book. 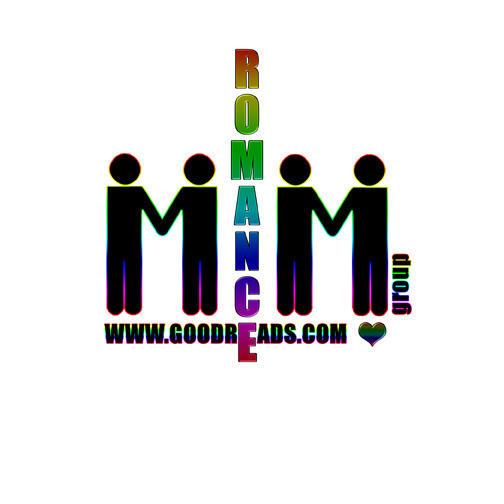 This entry was posted in Book Reviews, Books, eBooks, Fantasy, LGBTQ Book Reviews, M/M Book Reviews, M/M Fiction, Science Fiction, Uncategorized and tagged dystopian society, enemies to lovers, gay snipers, gay soldiers, m/m dystopian society, m/m futuristic fiction, m/m futuristic romance, m/m novel, m/m science fiction, m/m science fiction romance, One Breath One Bullet, S. A. McAuley, Scattered Thoughts 5 star rating, Total-e-Bound Publishing.